GRAND OPENING PARTY IS TODAY! Doors Open at 5 PM! Come party with us! 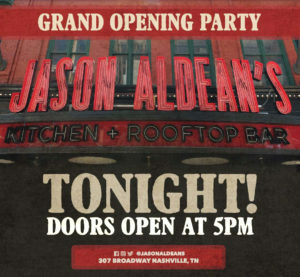 Jason Aldean’s Kitchen + Rooftop Bar Grand Opening is set for Wednesday! Get in line early for a chance to get into the VIP & FAN PARTY! You never know what’s gonna happen at Jason Aldean’s!